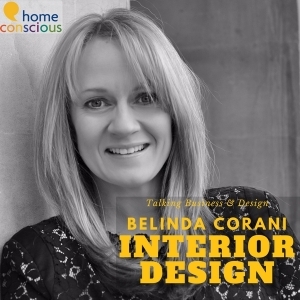 This is a quick video to show you what home improvement ideas are currently being undertaken at the Reading job. It’s been quite difficult to film and work at the same time but today things are quieter, as the clients are away, so we have more room to film, rather than a long meeting between myself and the client, which would take up all of my time when there. We start off in the sitting room where the painting has been completed. It’s very different to the yellow (below) that was there previously. We are still awaiting the installation of the new curtains so the old curtains are going back up, just for security reasons, before we do the final installation. This is the Sitting Room before we started work.. 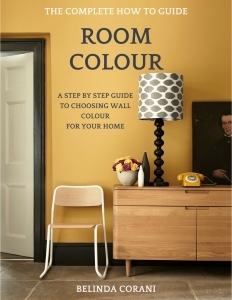 The paint colour we have used is by Little Greene and is called Julie’s Dream. It’s a very pale pink with a hint of peach. It’s almost a neutral, but it does give a nice warm glow to the room. 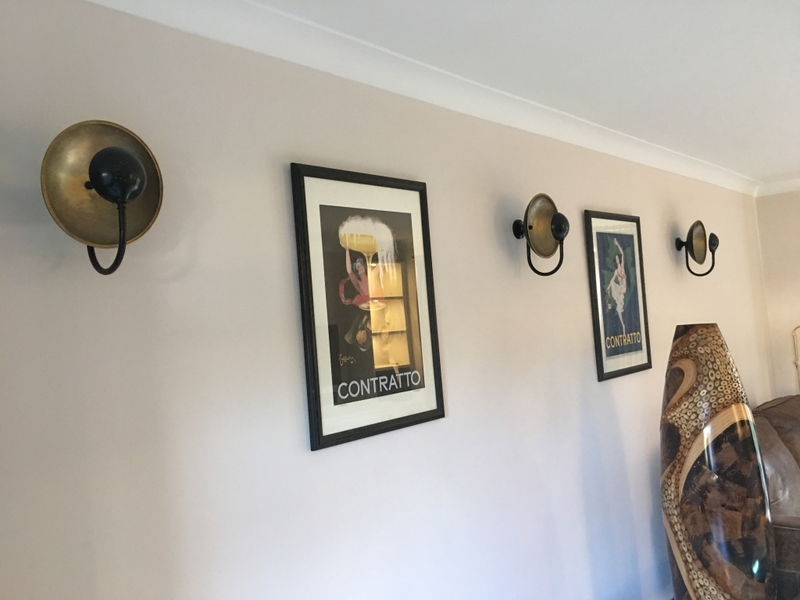 In the video, we also look at where the new wall lights will be placed in this sitting room. You can see them in the photo above, along with some artwork, floor lamp and sofa that are the client’s. This is where the new joinery and TV unit will come into its own. The shelving will have lights built in and eventually there will be lights on the bookcase as well, that will match the new wall lights. Meanwhile, in the hallway, you can see all the paint pots lined up as the decorator continues his work in this area. There will be a sideboard going into this hallway, which will have artwork above and a decorative table lamp upon it, just to change the feeling of this space and make it less of a hallway and more of a welcoming area at the front of the house. As you may or may not know, I love hallways – they are my favourite room in the house and I always like furnishing them to make them less of a through-way – more a room in their own right. We have also added in new flooring to both the hallway and the sitting room. This is an engineered oak floor, which has a finish of ‘washed white with hard wax oil’. These particular boards are 190 mm in width. I always like to have a decent width in wood flooring, because using a narrow width can make the floor appear very busy and can look very much like a laminate floor, which is not something that you want to do on a project of this type. So this flooring has gone into the hallway and continued into the sitting room. 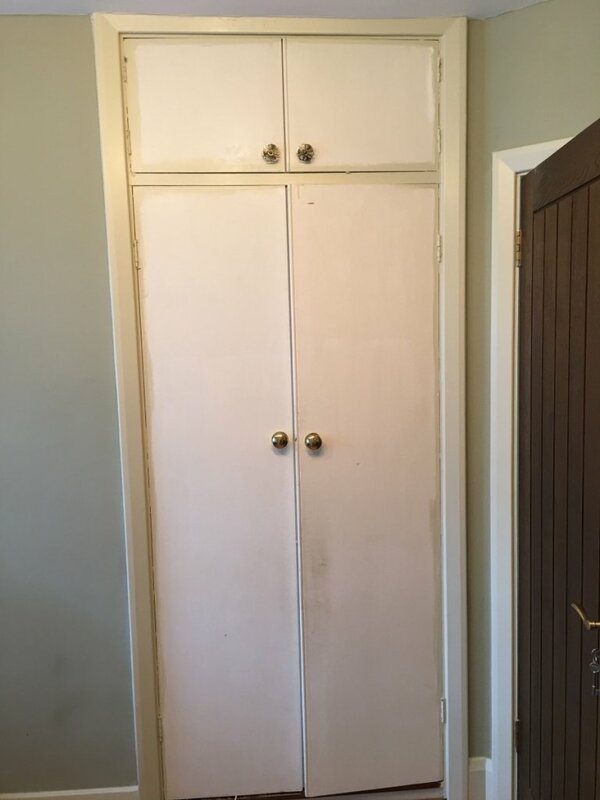 The Study cupboard doors are also due to be changed by the joiner. We didn’t really want to keep them as they were old, plain, and didn’t look very interesting. At the same time, we wanted to change the shelving within the cupboard to accommodate filing, books, papers, and of course, a new shelf for the printer and shredder. New handles and knobs are also on the cards. A definite home improvement! But first we have to clear the cupboard of its contents and remove the doors so that the work can commence. This is what it looked like before we took the doors off..
On the landing we have a boiler cupboard and a cupboard for the cistern and plumbing pipes; with shelving above acting as an airing cupboard. The plan is to change the outside doors completely and to remake the shelving to make it more sturdy than the current flimsy ones! You can also see the skirting radiators around the house too – and these are not very common at all. I am not keen on them either, as they make all the furniture sit proud of the walls and they look rather unsightly. Also on the landing we talk about paint and colour matching. 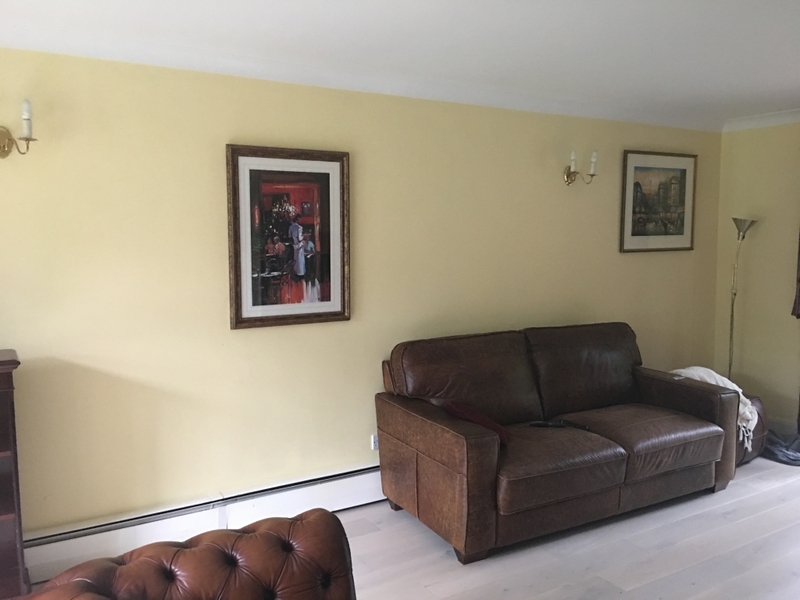 This can be an issue if you are asked to repaint walls or woodwork in a property and you do not have the existing paint or no of the existing paints colour or code that is associated with it. It can be a case of trial and error. Sometimes more error them trial! This colour is a form of Farrow & Ball’s ‘Churlish Green’ which is quite a strong pea green but works well with the reds of the stair runner and the dark timber doors that are dotted around the house. Along with the paint on the walls, we have also wood stained one of the posts on the four poster bed that we have in the master bedroom. It’s actually come up quite well and I think the client will be pleased when she sees it. Whilst in the master bedroom, we look at the new cane armchair for the corner of the room and we also take a quick view at the new bedside tables that will match in with the existing four poster bed and overhead lights. b) you use the existing furniture as a centre;but top and tail the scheme with something different altogether. I have gone for the latter. Adding in lighter wood to this room has been something that was badly needed. I needed either white washed wood or a very pale timber in order to lighten the entire scheme and to blend nicely with the elegance of the new curtains that are due in. It’s going to look very different and who knows maybe I’ll get to change the bed and lights at some point in the future! If you want to look at an earlier video then have a look at this one and see where the project first started..
See you on the next video for more updates! Happy designing!